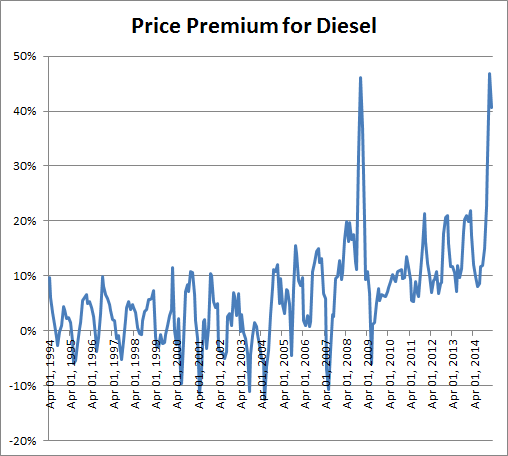 Lately I've been seeing a very steep premium for diesel fuel prices over the cost of regular gasoline. One of the pricier stations had regular for $2.25 and diesel for $2.95. Thats a 31% premium. Of course thats just one example. The current difference is abnormally high. You can see the large spike for the most recent data which is way off the chart compared to normal. Usually the % difference is less than 20% but now its hit over 40%. You can also see that it varies seasonally. 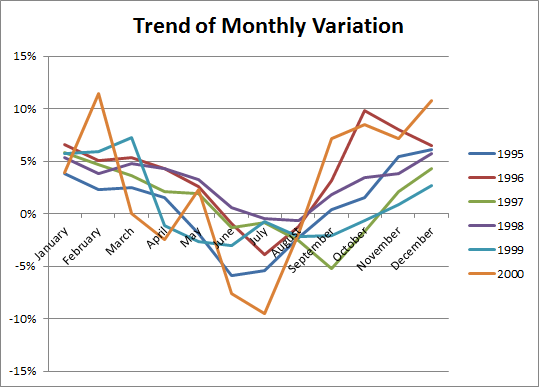 I plotted monthly prices for a few years 1995 to 2000 to see how the difference varies month to month. Overall diesel averages about 6% higher than gasoline over the long run. The mean and median are both 6%.